Fifty years after Martin Luther King Jr.'s death—and at a time when race relations and social justice are again at the forefront of our country's consciousness—this book expands on a Frist Art Museum exhibition to present a selection of approximately one hundred photographs that document an important period in Nashville's struggle for racial equality. The images were taken between 1957, the year that desegregation in public schools began, and 1968, when the National Guard was called in to surround the state capitol in the wake of the civil rights leader's assassination in Memphis. Of central significance are photographs of lunch counter sit-ins in early 1960, led by a group of students, including John Lewis (who contributed the book's foreword) and Diane Nash, from local historically black colleges and universities. The demonstrations were so successful that King stated just a few weeks later at Fisk University: "I did not come to Nashville to bring inspiration but to gain inspiration from the great movement that has taken place in this community." The role that Nashville played in the national civil rights movement as a hub for training students in nonviolent protest and as the first Southern city to integrate places of business is a story that warrants reexamination. The book also provides an opportunity to consider the role of images and the media in shaping public opinion, a relevant subject in today's news-saturated climate. Photographs from the archives of both daily newspapers are included: the Tennessean, which was the more liberal publication, and the Nashville Banner, a conservative paper whose leadership seemed less interested in covering events related to racial issues. Some of the photographs in the exhibition had been selected to be published in the papers, but many were not, and their disclosure reveals insight into the editorial process. In several images, other photojournalists and news crews are visible, serving as a reminder of the almost constant presence of the camera during these historic times. 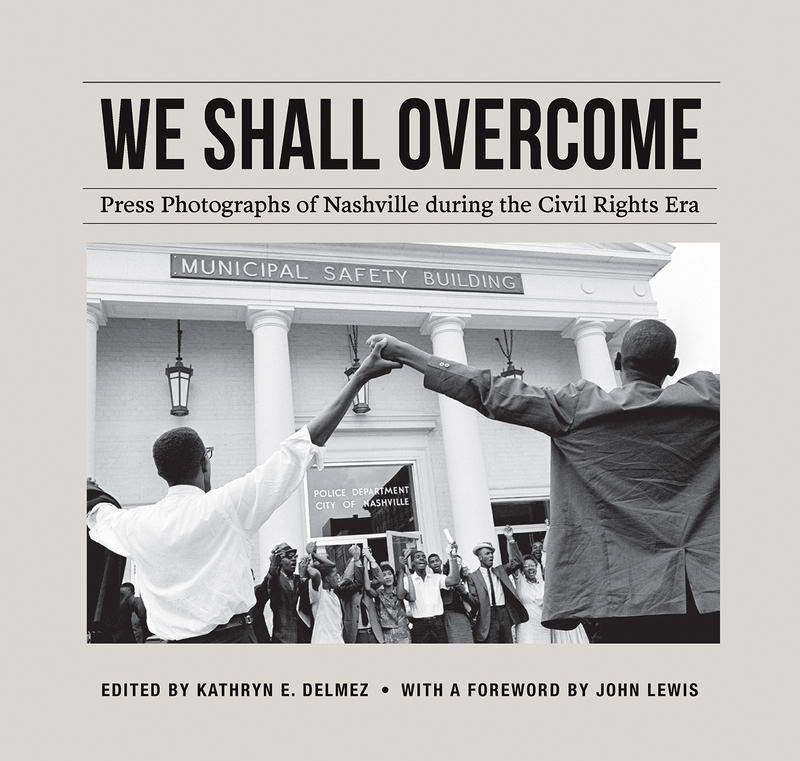 Essays by Linda Wynn of Fisk University and the Tennessee Historical Commission and Susan H. Edwards, executive director of the Frist Art Museum, offer historical context on Nashville during the civil rights era and on photojournalism, respectively. Congressman John Lewis's foreword recounts memories of his time in Nashville and reminds us that there is still work to be done to build King's Beloved Community. Kathryn E. Delmez is a curator at the Frist Art Museum in Nashville. "[Nashville's] stories about the orderly desegregation of schools and the peaceful desegregation of lunch counters and the benign treatment of black people by the white people in power? That's all a myth. 'We Shall Overcome: Civil Rights and the Nashville Press, 1957–1968,' a set of photographs assembled by the Frist Art Museum, exposes such mythmaking for what it is. . . . Copies of the companion volume to the photography exhibit will be distributed to all branches of the Nashville Public Library and to every public school in the city, and all members of the Tennessee General Assembly will receive a copy to deliver to the public libraries in their own communities. Here's hoping they pause to take a look first. There's a truth in these photographs that many of them have likely never seen before." "This book, the catalog of an exhibition at Frist Art Museum in Nashville, captures a decade of everyday bravery and trauma as recorded in photographs, drawn from city archives, by Nashville photojournalists."